Honey bees have an essential role in nature that goes beyond the production of honey and beeswax. They pollinate wild flowers and many crops, so our food sources depend on bees. Moreover, the ability of honey bees to continue this activity depends on beekeepers. They should be maintaining a healthy population of bees. Unfortunately, as living organisms, honey bees are also subject to diseases. Their life is characterized by eusociality, many thousands of bees are living together. Because of such a way of living, individual bees have frequent contact with other bees in the colony. A frequent behavior among bees is sharing and orally passing of the food, so bee diseases or parasites are spread fast. Migration and sale of bees and equipment, even among continents, make the problem with bee diseases more prominent. A bee colony has its defense mechanism, but sometimes the colony is too weak and needs help from a beekeeper. An essential part of beekeeping is the inspection for bee diseases. Every beekeeper should be able to recognize the symptoms and know what to do. To help you, our fellow beekeepers, we made a little list of common bee diseases; including their symptoms and how to control them. The chalkbrood disease is caused by the fungus Ascosphaera apis which affects honey bee brood. The danger to bees are fungal spores formed during sexual reproduction. Honey bee brood is infected by absorbing spores via the body surface or food. The infection can usually be observed in larvae that is 3-4 days old. The first symptom is that the dead larvae are covered with white cotton like mycelia of the fungus and swell to the size of the brood cell. In the second phase they shrink, harden, and turn into a chalk-like mummy. Depending on the stage of mycelia growth the dead larvae can have three colors: white, grey, and black. The black color of the dead larvae is caused by the formation of the fruiting bodies. In hives with a higher number of infected larvae mummified larvae will make a rattling sound when infested combs are shaken. Also, mummies can be found on the bottom boards or at the hive entrances. Currently, there is no successful chemical control against chalkbrood. The infested brood is removed by bees during their regular cleaning. Cleaning is especially effective for white mummies which have to be removed quickly. If left for too long, spores carried by circulating air may enter brood cells. When larvae have turned black, cleaning done by the bees only spreads the spores. You can stimulate bee’s cleaning behavior by changing the brood rearing conditions. The hygiene behavior of bees can be stimulated by placing the hive at a good foraging site or by feeding the bees with honey or sugar water. You can even spray individual combs with a thinned honey. Since bees have to inspect the whole hive and brood cells, you should decide on the hive size based on the strength of the colony. A weaker colony should have smaller hive, while stronger colony can have a bigger hive. A weak colony should not be given a big hive because those bees won’t be able to inspect the hive properly and clean all brood cells. You should always make sure that the hive is ventilated properly, and free from moisture. Also, worker population should be strong. If the chalkbrood infection is not severe, feeding bees with sugar-syrup, hatching brood, and adding adult workers is usually enough to control it. Nosemosis is one of the most destructive diseases of adult bees. It affects the whole adult population of the colony (queen, workers, drones). Severely infected worker bees cannot fly so they may stand trembling on top of the frame or crawl at the hive entrance. The infection also causes high rates of winter losses, especially in areas with long periods of no flight opportunities. Severe infection reduces the strength of the colony which can result in greatly reduced productivity. Nosemosis is caused by the spores of protozoan Nosema apis. The spores are absorbed with the food and germinate in the bee’s midgut. Penetration into the gut wall results in the formation of new spores which can be defecated, spreading the infection. 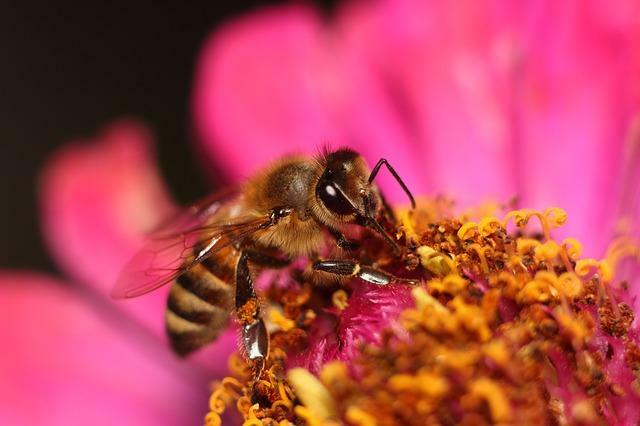 Infected bees have impaired nutrition, especially protein metabolism. So far there is no reliable diagnostic to check the bee for this disease without killing it. The separation of healthy and infected bees may only be possible in cases of severe infection. The abdomen of infected workers is often shiny and swollen. The best method for detecting Nosemosis is diagnostic in a lab using a microscope. The diagnostic require a sample of 20 adult workers suspected of being infected. They are killed, and their abdomens are taken out to be checked under a microscope. If the queen is infected, the productivity of the colony may drop, and she may become the major cause of spreading the disease. For any beekeeper, a possibility of the queen being infected is hard to deal with. You don’t want to destroy the queen based only on suspicion. However, by inspecting the feces of the queen, you can avoid killing her. The inspection is done using a microscope to check the presence of spores in queen’s feces. The best control is keeping colonies strong and removing possible causes of stress. The hive should be properly ventilated, and the colony should be protected from the humidity and cold. To prevent spreading of the spores within the colony, bees should regularly forage so they can defecate. If you suspect that your equipment might be contaminated, you should decontaminate it by fumigation and heat. To prevent the outbreak, you should change the combs once every two years. Currently, the only effective chemotherapeutic method for treating Nosemosis is to feed the colony with fumagillin. Since the active ingredient is antibiotic, it should not be given to bees when there is a chance of contaminating the honey. Since there is at least 18 virus types and strains, fighting against them can be difficult. The examination for these diseases has to be done in a lab with sophisticated equipment and procedures. The damage to colonies varies on several factors. Some of them are the type and strain of the virus, the strength of the colony, and food availability. Bees usually have good protection against virus infections because of their chitin body shell and gut coating. But, parasites sucking the blood of the bees can penetrate their protection which leaves them open to viruses. We will mention only the most widespread virus infection - sacbrood. Infected dead larvae don’t pupate after four days and remain stretched out on their backs within their cells. Their head and thorax are the first parts of the body that change color ranging from white and yellow to dark brown and black. The dead larva removed from the cell seems like a sac filled with water. Larvae that remain in their cells eventually dry out to flat scales. So far there is no chemotherapeutic agent effective in controlling or preventing sacbrood disease. The colony can usually recover from the infection through hygiene behavior of bees, especially if the disease is common in that area. As with other diseases, hygiene behavior of bees can be stimulated by a beekeeper. The infection usually occurs when the colony is stressed (lack of food, cold weather, lack of space, etc.). In case of severe infections, you should strengthen the colony by changing the queen, removing infected brood combs, adding workers and food. American foulbrood disease is regarded as probably one of the most destructive microbial diseases that affect bee brood. Wherever colonies or Apis mellifera are kept this disease is widely distributed. Its bacteria can remain dormant for more than 50 years, and the disease is contagious. For this reason, it is essential that beekeepers can recognize the symptoms and know how to deal with it. American foulbrood disease is caused by a spore-forming bacterium Paenibacillus larvae which only targets bee brood. In the beginning, the infection will only result in a few dead larvae or pupae, but if it goes unnoticed, it can spread to other colonies and apiaries. The spores of the bacterium usually enter the hive through foreign honey. In the first stages of an infection, you can find isolated capped cells on the comb that are colored darker than healthy cells. Also, while healthy caps are fully closed and slightly protruding, caps of infected cells are sunken and often punctured. Later you can notice an irregular pattern of sealed and unsealed brood cells which easily distinguishes healthy and infected brood. The dead larvae are at first white but gradually change to brown and dark brown. Unlike sacbrood, the dry brood lies flat on the lower side of the cell wall. The bacteria can be identified using a microscope or by cultivating a selective culture media. Since food combs and brood combs are, besides the bees, the main carriers of spores, they should be destroyed. Dry combs with no brood can be reused if a lab examination of wax samples doesn’t find any of spores, else they have to be destroyed. If the infection appeared in an old hive, it should be destroyed entirely by burning it. Hives made of wood should be carefully cleaned and then singed out with the flame of a gas burner until the surface of the wood gets slightly brown. If you have a plastic hive, then the flame is not a good idea, and you should disinfect the hive with 3 to 5 percent sodium hydroxide. Be careful not to leave any residue when using substances because it might be dangerous to bees or the consumer of the processed honey. Many times the whole swarm is killed to prevent the spread of the disease, but that can be avoided by using the artificial swarm method. This method requires a clean, decontaminated hive with three to six wooden bars instead of combs and a wax trip for comb construction. The number of wooden bars depends on the strength of the colony. You can prevent the disappearance of the queen by putting a queen excluder above the bottom of the hive or at the entrance. Such prepared hive should be placed at the colony’s old stand, and the bees should be pushed/brushed into the hive. After three days the bees partially construct the combs which should then be removed and burned. With this last step, the sanitation is finished. There are chemotherapeutic methods of control which involve the administration of antibiotics or sodium sulfathiazole mixed with powdered sugar or sugar syrup. They prevent the multiplication of the agent, but they will not kill the spores. The treatment must be repeated several times, in shorter and shorter intervals. Since the treatment doesn’t kill spores, you should also disinfect the hive simultaneously, or the disease might come back after treatment. The cause is the bacteria Melissococcus pluton which doesn’t form spores. Usually, larvae infected by EFB die when they are four or five days old. As the larvae decay their color changes from white to pale yellow and then to brown. Unlike AFB scales, the scales of larvae killed by EFB do not adhere to the cell walls, and they are rubbery. The infection comes with a specific sour odor coming from the decayed larvae. Furthermore, most of the infected larvae die before their cells are capped. If the pattern of sealed and unsealed brood is scattered, the colony is severely infected and probably weakened. EFB is transferred in the same way as AFB. The control method depends on the severity of the infection. As with other diseases, for weak infection, the stimulation of hygiene behavior of bees is usually enough. Stronger infections require removal of the most infested brood combs and replacing them with empty or healthy combs. For severe infections, the methods used are the same as for AFB. The occurrence of many bee diseases can be prevented by regular hive inspections and keeping good hygiene of your hives and tools. By doing regular check-ups, you learn what behavior is normal so that you can notice the problems easier. Our little guide can help you recognize early symptoms of common diseases and prevent great damage to your colonies. If you are a beginner, you should definitely learn about common bee diseases. Letting bee diseases “go wild” can result in death of your colonies and might also create big problems for other beekeepers in your area. If you suspect that your colony might be infected, take action right away. It is better to have a false alarm and in the end find out the problem is something far less severe, than to postpone a proper inspection and end up with dead colonies. Remember, to be prepared is half of victory!